Found growing on trees and rocks of dry tropical forests on the island of Madagascar, the orchid Acampe pachyglossa has evolved thick leathery leaves and the same metabolism as cacti to cope with the dry conditions. Adopt the entire Acampe pachyglossa species as an exclusive gift for any occasion. Madagascan orchids come in all shapes and sizes. Some orchids live on the ground (called terrestrials) whereas others grow perched on trees (epiphytes) or rocks (lithophytes). They are found in almost every habitat on the island, from the coast to the highest mountain summit, and from the rain forest to the spiny forest. 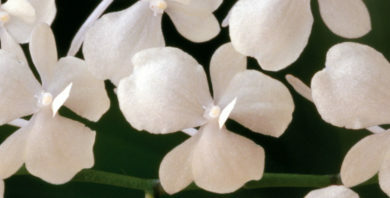 All orchids are protected in Madagascar and cannot be collected except under licence. You can adopt this entire species as a gift for £2,000. Your donation will be used to maintain the Millennium Seed Bank Partnership, ensure this species is kept safe forever in the vaults, and to collect more species in the future. Aerangis citrata orchids are usually epiphytes found growing on twigs or small trees in humid, evergreen forests from coast to plateau throughout eastern Madagascar. Adopt the entire Aerangis citrata species as a superb gift that ensures it is kept safe forever in the Millennium Seed Bank Partnership vaults.